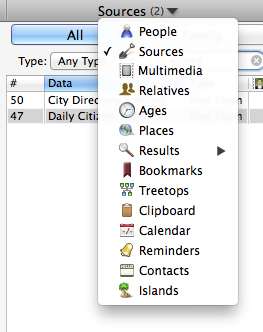 My Search for a Family Tree Maker for Mac Replacement. I decided to go back to looking at Mac specific products. The difficulties of working with C: and F: drives and lack of adequately accessing my file system was too frustrating. and again last June (Heredis 2015). What I didn’t mention on my blog was that I only used it for three of the dozen or so family trees I manage. I liked a lot about it but the surname issue I mentioned before and the cumbersome process of associating my source and citations to a fact, event, or location that I couldn’t seem to overcome caused me to continue working with Family Tree Maker for Mac 3 with my larger trees and not convert them to Heredis. I tried working with it again in earnest and decided I might use it, but I thought there must be something I like better. Gramps is an open source program for managing genealogical data. There were quite a few things about it that I liked. (No cost is good.) I liked how you could focus upon an individual and not be burdened by family unit information. The way you could enter relationships that didn’t include marriage yet did include children was nice. However, the proof of the pudding was how it handled entering source/citation/textual data then associating it to multiple facts involving multiple individuals. Again, I found it cumbersome. I only gave it a few hours and I think I might have figured out better processes to handle it, but I decided to continue and research some other products. I had version 5.5.5 several years ago and see that they have updated it several times since. The latest is Mac Family Tree 7. I downloaded their demo version, 7.6.2. It is supposedly the same as their paid version except you can’t import, can’t save, and can’t print. So, I began putting a tree together using my process for documenting a source and then associating it was individuals and their facts and/or events. Not bad — certainly better than Gramps and Heredis and much simpler than RootsMagic. I decided that it was definitely a contender, but I wanted to continue. One of the many websites I looked indicated that they thought Reunion was the best. I had Reunion 9 a number of years ago and liked it. I used it until I went to Family Tree Maker for Mac (FTM4M) because I wanted the replication to Ancestry Trees that FTM4M allowed. Their new version, Reunion 11, has a free evaluation version that allows for 50 people, no import or export, watermarked reports and some other limited features. Luckily, it allowed enough functionality for me to test my work processes. Wow – I was impressed. I really loved how you can put almost anything you want on the left side of the screen, including sources. Then you can enter your facts, events, or notes and drag and drop the appropriate source citation to the fact. It was a really a smooth process. Reunion, like many other systems, doesn’t deal well with multiple names. For example, my grandfather was born Clifford Durwood Brown. He went by Richard Durand for many years (married and had two children) and then changed his name to Richard Earl Brown. RootsMagic handles that really well. Most other genealogy programs don’t. Many require you to pick one name as the individual’s name then make aliases for the other names. Reunion has a few suggestions. In the case of my grandfather, I could use Richard Earl Brown because that was his name at his death. I could also use Richard Durand because that is the surname that most of his children were raised with the Durand surname. In either case, Clifford Brown would be an alias or “AKA.” It just doesn’t seem right to me to make someone’s birth name an alias. They mention the problems with that as the alias names don’t show up in the indexes reports. I wish that Roots Magic, or Legacy Family Tree for that matter, made an actual Mac product. Until they do, I’m going to use Reunion and hope they can improve their multiple name handling issues cause the rest of Reunion seems to be just what I’m looking for.